The Greek Islands, ranked #37 in our countdown of '100 Ultimate Travel Experiences of a Lifetime'. Ranked #37 in our countdown of ‘100 Ultimate Travel Experiences of a Lifetime’. An essential part of the Greek experience, island hopping around some of the most beautiful islands on earth, is all about sun, surf and unforgettable sunsets. 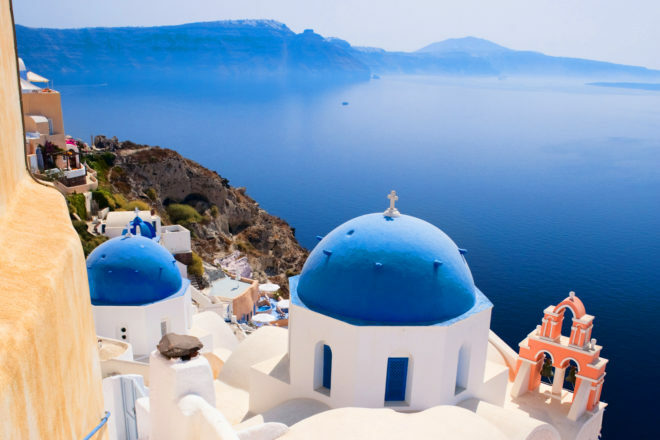 Whether you are after the glamour of Mykonos, the multicoloured cliffs of Santorini or the cobbled streets and ancient history of Rhodes, deciding where to go next is half the fun. A true blend of culture and bliss, you will never hear anyone complain about the awful time they had in the Mediterranean, and that we can guarantee. Who wouldn’t want to spend a dreamy summer in Greece? Go to blog.expedia.com.au/bucket-list for more information about the Greek islands.